HIS IceQ is being recognized as award-winning & performance-leading cooling technology from major media worldwide. HIS IceQ is endorsed as the most efficient cooling technology among the current mainstream graphic cards' series. HIS IceQ can actively draw the air inside your PC case to cool down the card, and blows amounts of hot air out of your case, dramatically decreasing the GPU temperature together with your PC components. Ultra quiet HIS IceQ fan keeps the noise level below 30dB. HIS IceQ is also UV sensitive, enhancing the gamers’ UV light case. Hi-Fi Concept output with gold plated. 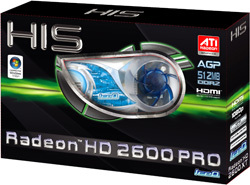 Starting from the new Radeon™ HD 2600 Series, HIS has applied the “Hi-fi” concept design on its new models. Features include: high-quality gold-plated ports, black panel plate which sync. with the “High-definition” concept of the new Radeon™ HD Series. I bought this card from new egg a little over a year ago, and I have been nothing but pleased with the results this card has given me. It is a blessing for those of us that still have AGP on our motherboard. 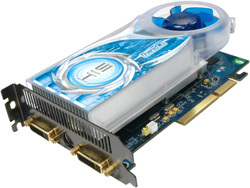 I would recommend this card to anybody who is trying to squeeze every ounce of power out of their AGP system. Works for me!